you already know it looks beautiful! 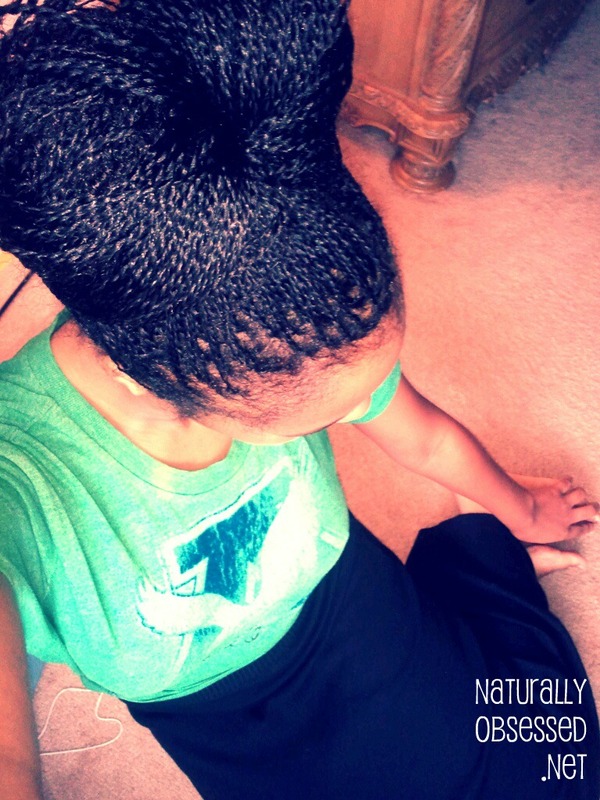 :-) my ends give me such trouble w/length retention but this gives me some inspiration. i may have to be a little bit more diligent than some with dusting to get to my desired length. Ahh, these are gorgeous. I love them up in the bun! Your twists are so beautiful. ♥ them. 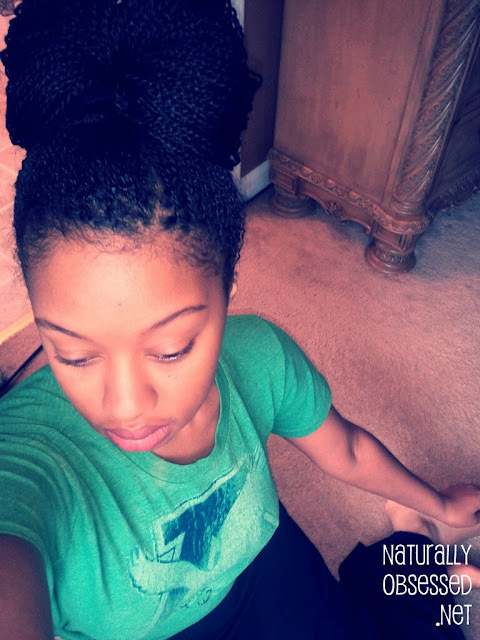 Your twists always look so good! I also do love them up in a bun. I also enjoy the last part of that video I was cheesing hard watching you and your baby. Thanks for sharing and God Bless you and the family :). Thank you for making the video. Your twist look fantastic and your daughter is adorable. Thank you for sharing your blogs with us! Do you baggy your ends in this style? How exactly do you do that bun?! It's gorgeous. wow! i would really love to try this style but i fear that i won't have the patience to take them down without damaging my hair. i've done mini twists before but never this small! could you keep us informed on that whole process? Beautiful! I was hoping to learn more about how you part the top of your head, and you didn't disappoint! I plan on doing some microtwists this month myself...mini and micro twists are my fav style. How do you deal with buildup? I find that after a week, the front of my hair has a lot of buildup, and after two weeks, it looks nasty and I have to either take it down or wash it, which leads to shrinking. And your adorable little girl just made my day!!! I loved the way the two of you interact!! thank you for posting this video. you inspired me to do some small twists on my silkened hair in a month and a half. i never realized you did it on blown out hair, but it'll be perfect for me when i'm tired of straight hair and/or it starts to look not so hot. and your girl? totes adorable! I wanted to know if you are putting any product on your hair while your twisting? I just did mini twists. I am on day 5 and they are already frizzy! How do I prevent frizz? Do you work out often and if you do, how do you wash your hair while in the micro twist? Please post your micro twist routine and your hair looks amazing. I sorta want to do mini twists just because I am sooo tired of being bothered with my hair, But I am kind of scared to do it, and I think with good reason. So I wear twists at least 2-3 weeks in a month but lately when I am about to take them down after maybe five days of wear, my hair is beginning to lock. Let me see if I can explain. Its not locking like my hair is matted but its more like I coiled my hair and then twisted two coils together into a twist. So when I take my twists down, I have to uncoil each piece too. And at first I thought it was the product I was using so I changed products but it still happened. And I've been twisting my hair for the past year, so this isn't anything new and I don't think I have changed my twisting technique but I don't want to do mini twists and leave them in for 2-3 weeks and then try to take them down but by then hair has really started to lock. Do you have any take on why this may be happening? Hey KKQ! Have you ever noticed whether or not your hair is thinner in some areas than other? The back left side of my hair is thinner and shorter than every other part on my head. Can I still do this style? i cant seem to keep my hair straight in twists. the like to coil up on eachother and dont hang like yours does. i dont twist as small (could be the problem) but i wonder if its all the sweating from working out? i know you cant tell me for sure but have you ever had this problem when your hair was shorter? Do you ever have isues with frizz? If so, how do you deal with it without affecting the twists? Hello! I plan on doing mini twists this weekend and I was wondering if my process will be non damaging to my hair. I have not applied any heat to my hair since I began my natural journey in January. Would this process be ok...I'm still learning.